The last two eastbound passenger trains on the Chesapake & Ohio's old Hocking Valley Division leaving Logan. The Athens train is on the left with Pacific No. 455 and the Pomeroy train is on the right with No. 449. On this special day the two trains left Logan together. 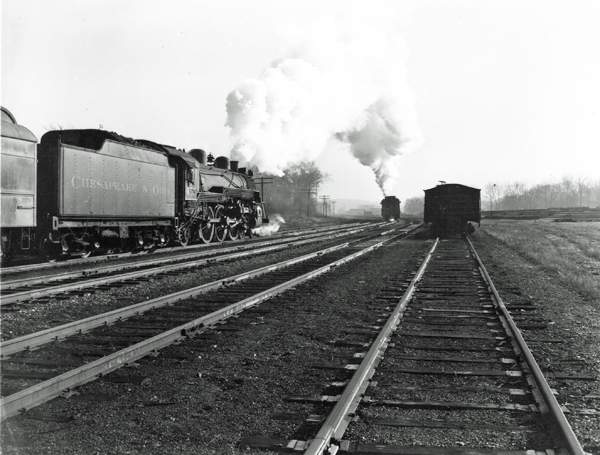 The Chesapeake & Ohio Railroad's passenger train from Columbus south (railroad direction east) operated as one combined train as far as Logan, where it was split into two trains and another locomotive full of coal and water added for the longer run to Pomeroy and return. After the Pomeroy train departed, the locomotive from Columbus coupled onto the remaining train for the shorter run to Athens and return. The train from Columbus to Athens left daily except Sunday in the morning as No. 30 and returned as No. 37. The train from Logan to Pomeroy was No. 130 and returned as No. 137. Earlier, there had been more passenger trains on both the lines and their associated branches. Train No. 30 took 2 hours and 45 minutes to cover the 76 miles from Columbus to Athens, had a 5 to 6 hour layover in Athens, and returned to Columbus in 2 hours and 30 minutes. Train No. 130 took 3 hours to cover the 83 miles to Pomeroy, had a 1 to 2 hour layover, and returned as train No. 137 in the same amount of time, but it had more stops and had to climb the grade to Summit in both directions. In earlier years, Hocking Valley Ten-Wheelers handled these runs, but engine 89 was dismantled in April 1949, engine 90 in 1947, engine 91 in April 1949, and engine 92 had been wrecked north of LeMoyne in 1928. By about 1949, C&O Pacifics handled all these runs. Regular passenger trains operated on the Chesapeake and Ohio and its predecessors for 69 years to Pomeroy ending December 31, 1949. New York Central passenger trains had trackage rights to operate their passenger trains into Pomeroy, Gallipolis and Athens. These trains lasted a little while longer, but were gone by April 27, 1952, when the next employee timetable was issued. The last trip carried more passengers than usual and according to one rider, there was a lot of whistle blowing. In the Twenty-first Century the River Division from Oldtown (just south of Logan) to Pomeroy is gone with the exception of ten miles of track between Kanauga and Hobson now used by the Norfolk Southern. John Brown a retired C&O dispatcher worked in the Spahr Building across from the State House in Columbus. Mr. Brown started as an operator/agent on the C&O's Hocking Division working his way up to dispatcher often on the line from Columbus to Pomeroy and Columbus to Athens. A couple of things he told me were that the agent at McArthur was almost deaf, but could hear the telegraph key, and that a lot of sand was shipped from Kerrs. Most of the photographs were taken by Bob Rieth, except two at Logan that Roger Humphrey took of the Athens crew and the Pomeroy train leaving Logan on that last day of passenger service.